Inkondlo: "Namibia, Land of the Brave"
INamibhiya (isiNgisi: Namibia) linguzwe lase-Afrika. 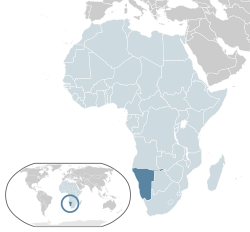 Linamaphethelo neNingizimu Afrika, neButswana, ne-Angola neZambiya. ↑ Central Intelligence Agency (2009). "Namibia". The World Factbook. https://www.cia.gov/library/publications/the-world-factbook/geos/wa.html. Retrieved 23 January 2010. This page was last edited on 5 uZibandlela 2017, at 10:47.